No time to soak and boil dried chickpeas? Shave some time off this recipe by using canned chickpeas. Just be sure to rinse them well in a mesh strainer. 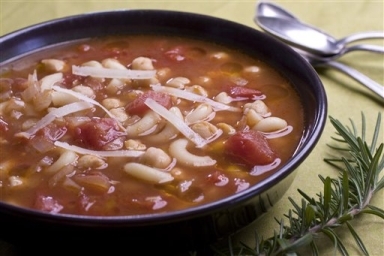 Canned beans can be very salty, which could throw off the flavor of the soup. In a large bowl, soak the chickpeas in cold water overnight. The next day, drain the chickpeas and place them in a large saucepan with enough water to cover them. Bring the pan to a boil, then reduce to medium and cook uncovered for 45 minutes, or until very tender. Drain and set aside. In a large, heavy-bottomed saucepan, heat the oil over medium. Add the onion, garlic, rosemary, pepper flakes and a pinch of salt. Cook for 8 to 10 minutes, stirring often, until the onion has softened. Increase the heat to high. Stir in the tomatoes, tomato paste, stock and chickpeas. Bring to a boil. Remove and discard the rosemary stalk. Add the pasta, reduce to a simmer and cook until the pasta is tender, about 12 minutes. Season to taste. Serve sprinkled with Parmesan and drizzled with olive oil. Nutrition information per serving (values are rounded to the nearest whole number): 326 calories; 97 calories from fat (30 percent of total calories); 11 g fat (2 g saturated; 0 g trans fats); 5 mg cholesterol; 45 g carbohydrate; 13 g protein; 7 g fiber; 1,144 mg sodium.